Following on from a recent post on Project Server PSI PowerShell scripts, I thought of a nice slightly more advanced example. 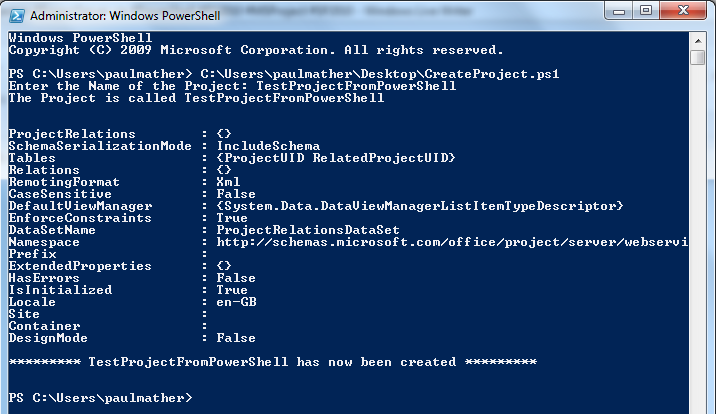 The script below will create a new project using the specified project template. $ProjName = Read-Host -Prompt "Enter the Name of the Project"
Write-host "The Project is called $ProjName"
Write-host "********* $ProjName has now been created *********"
A basic example of creating a project with a 5 or 6 line PowerShell script! Cannot convert argument "1", with value: "", for "QueuePublish" to type "System.Guid": "Cannot convert null to type "System.Guid"." I have tried this a few times, with different configurations, but with no success. Hopefully you can see what I may be doing wrong. Also just to point out, the guid used is of the Enterprise Project Type "Basic Project Plan." Other than this I am not sure what template to specify for the CreateProjectFromTemplate class. I can also get the $svcPSProxy.ReadProjectList().Project script to work so as far as I can tell, I do have things configured correctly. Any assistance on this would definitely be appreciated. Also, did you copy and paste the script from the post straight into PowerShell? If so it might be worth copying into notepad first then from notepad into the PowerShell editor in case of any encoding issues or delete and retype the (“)quotes. Hi, is it possibile to create a proposal instead of a project with powershell? This will create a standard project, to create a light weight project (proposal) see this article – http://epmxperts.wordpress.com/2011/01/27/create-light-weight-project-aka-proposal-using-psi/ – this isn’t via PowerShell though.